When people see the new 2015 Kia Optima on the road they often have to try to catch up to find out what kind of car it is. This is usually followed by a comment such as "That's a Kia? Whoa!" Just to give you fair warning. Should you end up buying a 2015 Kia Optima, you’d better get used to this type of behavior from other drivers. Check out the interior - We merged comprehensive artistry with state-of-the-art technology to offer an exceptional driving experience. Plush leather seat trim and ventilated seats offer comfort and refinement to driver and passenger. Hands-free Bluetooth and the UVO eServices infotainment system are complemented by the sophisticated and powerful Infinity sound system for maximum enjoyment. Eyes where you need them - the available rear camera display and backup warning system give a clear picture of what's behind you so, you can backup and back out with confidence in just about any situation. 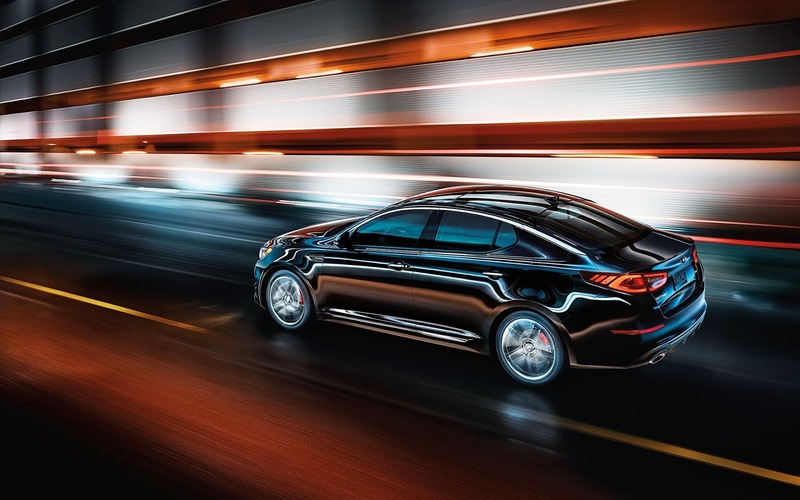 Performance that excites - the 2015 Kia Optima has an available six speed 2.0 L, 274 HP gasoline direct injection (GDI) turbocharged engine that is guaranteed to get the blood pumping and crank up the excitement factor. If you're looking for fuel efficiency, the optional hybrid model offers up to 36/40 mpg city/hwy. Safe and secure - the National Association of Traffic and Highway Safety (NHTSA) bestowed its highest five-star crash test safety rating to the 2015 Kia Optima. Crashing is not a nice thing to think about, but should the unforeseen occur it's nice to know someone's got your back. Check out the all-new 2015 Kia Optima at the Olympia Automall. We won't blame you if you don't realize it's a Kia at first. We’re used to that. But we also won't hold it against you if you fall in love with it. Don't say we didn't warn you about turning heads. If you’ve been looking for car dealerships in Puyallup, WA you found the right place. Come to the Olympia Automall our expert staff and wide selection are second to none. The Olympia Automall – Washington's largest!! !